There are a number of achievements in life that only one person gets recognized for but which take the effort of a team to accomplish. Nowhere is that truer than in a marriage, where one spouse might make incredible strides or publish trailblazing material, but being able to devote the time and energy to that passion requires at the very least the cooperation of the other spouse, if not the adding of ideas and inspiration. Many of these people acknowledge the tremendous debt they owe the unrewarded party, but the inequity of the balance of power can still gradually grow into resentment over time. 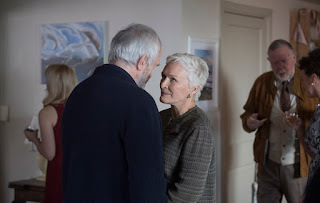 Joe Castleman (Jonathan Pryce) receives a phone call with the exciting news that his latest book has won him the Nobel Prize, and eagerly invites his wife Joan (Glenn Close) to pick up the other receiver so that she can share in his joy. As they travel to Sweden to receive the award with their son David (Max Irons), a budding writer who desperately seeks the approval of his father, a divide forms between the long-united couple as Joan sinks into the shadows of her husband, reflecting back on the formation of their relationship and confronting allegations about her husband’s past from a pushy writer (Christian Slater) who wants nothing more than to pen Joe’s biography. Joan is well aware of her role in this story, and even begs her husband not to thank her in his speech so that she won’t be perceived as the “long-suffering wife.” She is intelligent, loyal, and, well aware of the privileges she has gained from Joe’s success. Yet, as her husband receives the most-coveted award possible in his field, she realizes that perhaps, in supporting him, she has held herself back from living her own life and putting her mind and energy to the best use. Though this film theoretically should be Joe’s story, Joan, after so many years in being in the background, is finally ready to step into the spotlight and show what she can contribute. This is an incredible role for Close, who has herself shown what she can do, with six Oscar nominations in a career spanning over thirty-five years. She is all but guaranteed to receive a deserved seventh bid and possible first win for this magnificent turn, which truly guides the film. Pryce and Slater add commendable support, with their overly vocal male figures contrasting sharply with her more reserved, pensive attitude. Annie Starke and Harry Lloyd stand out as the younger versions of Joan and Joe, offering incredible context to their relationship. This film smartly and sensitively dives into a compelling dynamic, one that offers much more complexity than it initially appears.